Participatory Networking integrates end-users, hosts and applications in network management by supporting resource requests, traffic hints, and status queries. Apache ZooKeeper is a coordination service used at Twitter, Yahoo!, Netflix and elsewhere, where it fills a similar role to Google's Chubby service or Paxos quorums. During write operations, servers in the ZooKeeper ensemble must agree to commit each operation, a task which is sensitive to increased network latency. By augmenting ZooKeeper with support for PANE, and granting it the necessary authority, our PANE-enabled ZooKeeper can request guaranteed bandwidth for its traffic, which, in turn, leads to lower latency as flows do not compete in switch queues with other traffic. 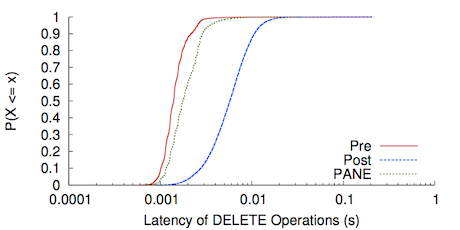 In the plot on the right, the red line is a CDF of the latency of ZooKeeper CREATE operations when running on an unloaded network, the green line is the increased latency when the links used by ZooKeeper's traffic are heavily loaded, and the blue line represents the return to lower latency when ZooKeeper exercises its authority to isolate its traffic using PANE. We currently use PANE's client library for Java applications to create and manage the necessary PANE requests. Implementing complete support for PANE in ZooKeeper, including introducing additional configuration parameters required only a few hundred lines of code. Further details of this experiment and its setup can be found in our SIGCOMM 2013 paper below, and we make our ZooKeeper benchmarking tool available for download. Rodrigo Fonseca. Participatory Networking. Microsoft Research (Redmond); August 8, 2012. 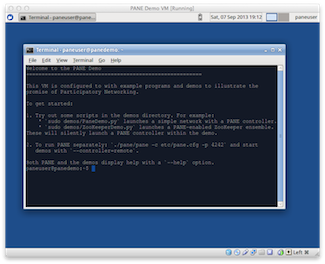 To make exploring PANE and its potential use cases simpler, we are providing this demo virtual machine. The VM uses Mininet to create a virtual network topology with PANE functioning as the SDN controller, and can use either Open vSwitch or the OpenFlow 1.0 reference switch as the virtual switches. The VM also includes a PANE-enabled version of ZooKeeper, the ZooKeeper benchmark, and a script which launches the experiment described above. In addition, all of the tools needed to further develop PANE are also included. The virtual machine is 64-bit Xubuntu 12.10, and requires Virtual Box to run. Finally, all of the files to create this virtual machine are avilable on Github. If you would like to create your VM for SDN development, check out the INSTALL file. Members of the Particpatory Networking project include Andrew Ferguson, Arjun Guha, Chen Liang, Betsy Hilliard, Jordan Place, Rodrigo Fonseca, and Shriram Krishnamurthi. Please contact Andrew Ferguson (adf@cs.brown.edu) with any questions or comments. The authors wish to thank Carleton Coffrin, Joe Politz, Jennifer Rexford, Scott Shenker, and Andreas Voellmy for helpful discussions, feedback, and assistance with this project. This work is partially supported by grants from the National Science Foundation, including NSF Award #1012060. Andrew Ferguson is supported by an NDSEG fellowship. This work is partially supported by grants from the National Science Foundation, including NSF Awards #1320397 and #1012060. Andrew Ferguson was supported by an NDSEG fellowship.